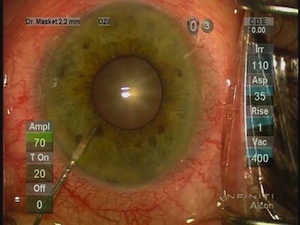 The Bhattacharjee Pupil Expansion device can expand the pupil with just a single 20G (0.9 mm) incision and no side-ports. A feat which no pupil device has been able to achieve. The best that is available is the Malyugin Ring which requires a 2.2 mm incision (often larger) and two side-ports. The device also reduces the severity and complications of IFIS by virtue of its anterior flanges dampening the billowing of the iris. Not yet available commercially. Completing continuation patent filing formalities. Will be entering into talks with prospective device manufacturers shortly after that. The device is very exciting and appears less traumatic to the pupil margin. While the device can be inserted through a side port it can be inserted with greater ease through the main incision as well. It does not snag the incision because of its design. The external size of a device may not reflect the size of the expanded pupil. This device comes in a 7 mm size too. While it can be easily used in standard coaxial phaco, the thin 0.1 mm profile & the ability of the device to expand the pupil with a single 20 gauge incision makes it very useful for small pupil Femtosecond Laser assisted Cataract Surgery (FLACS), Bimanual MICS (1.4 mm), Coaxial MICS (1.8 mm), Small pupil PPV (MIVS) & Shallow anterior chambers. In FLACS, if only a side port is used to expand the pupil then the patient can still benefit from a Femtosecond Laser generated superior quality truly Triplanar clear corneal incision. Moreover, smaller size & lesser number of incisions would reduce the possible risks of anterior chamber shallowing, infection & inflammation during imaging and Laser treatment. the malyugin looks easier and makes a bigger 7mm pupil i think. not sure why its so important to insert through side port, when one can insert through the wound.